If you told me I would be purchasing and eating Red Lentils 10 years ago I would politely said, “Really? 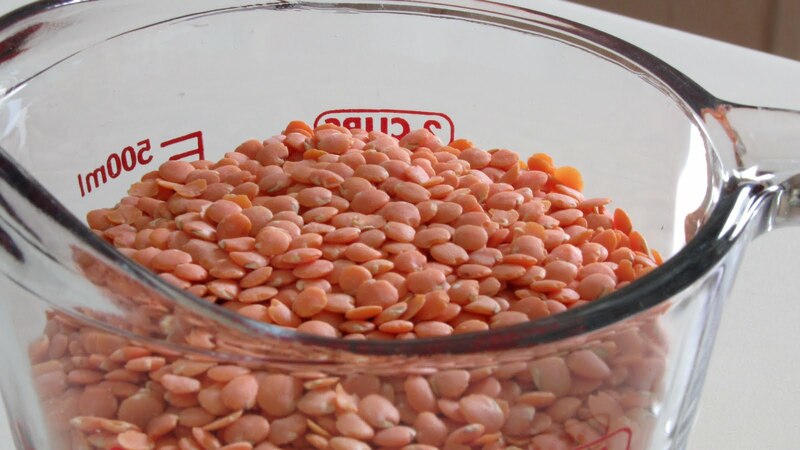 What are red lentils?” Okay, probably not. More likely I would have made some sarcastic remark. Times have certainly changed (though the sarcasm has not) and I’ve learned what lentils are. Not only that, but I like them. And not only that last weekend I finally found and purchased red lentils. We’ve been eating brown lentils for a couple years. I have a great recipes for lentil tacos and a lentil soup. Brown lentils are much easier to find. But I wanted red lentils. Red. I’ve been making a bunch of baby food for J, which is easy and kind of fun to do. K never would eat baby food so I never tried to make any before. But J is a good eater (this probably surprises you, but it’s true) and I’ve been looking for new foods to introduce to him. It turns out red lentils are a great option. They cook up soft and have tons of nutritional value…perfect. Even better, I found them in bulk at Whole Foods! Finding ‘red’ lentils last weekend worked out well, because I’ve been trying to do “Meatless Mondays.” My family doesn’t know this. Or didn’t until my hubby reads this post. (Actually, ever since he started the CarbLovers diet he is a lot more open to eating a few vegetarian meals.) Both he and I grew in ‘meat and potatoes’ homes. Lots of meat and lots of starch. There were exceptions to this, of course, but neither of us grew up with a super varied pallet. The older I get the more interested I am in other foods. I’m having fun experimenting with other nationalities’ cuisines. I can’t say I’m still all that varied, but I’m trying! So back to the lentils. Yesterday I got to cook red ones. Although they really look orange. I made some for J, however, the jury is still out on how much he likes them. I made Lebanese Style Red Lentil soup for us. It turned out pretty well, though I think it tastes better the second day. Yummy leftovers are a bonus! Well, what do you know, take a girl who doesn’t cook, give her three kids and a passion for the environment and it turns out she’s alright in the kitchen.. Apparently having many mouths to feed and wanting them to be healthy means creativity in cooking! So how about you? What are your favorite meatless meals? BTW, tonight we are having sausage gravy and biscuits. We can’t completely ignore the tradition of meat and starch!